Are you a Novation owner? The Novation Sound Collective is a platform providing free third-party software instruments and effects to all registered Novation users! Every two months you will be treated to free plugins and discounts off some awesome production tools. This month’s offer is in association with d16 Group and offers the Nithonat Drum Machine plugin. You can download the full version of Nithonat for FREE and save yourself over £85! This offer runs until 6th June 2019. You also get 50% discount on their web store up until 6th July. 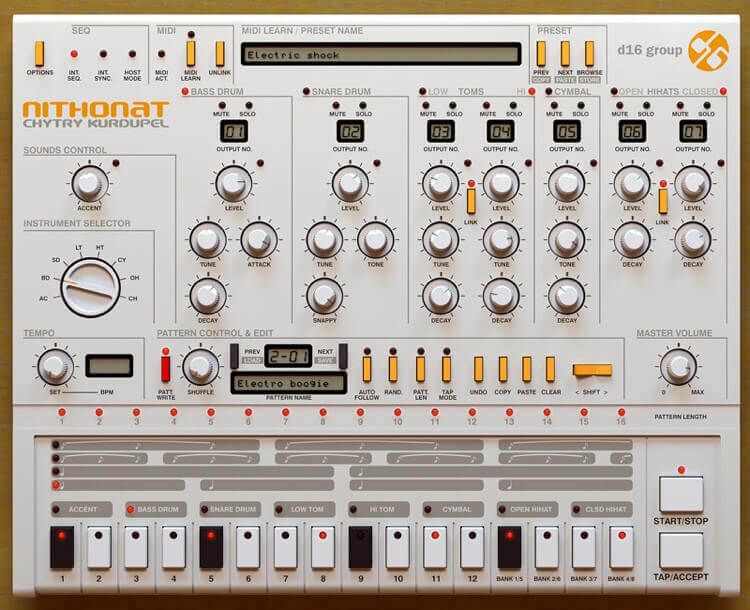 Nithonat is a flawless and fully synthesised software emulation of one of the grooviest drum machines ever built: the Roland TR-606. Released in 1981 as a smaller sibling to the TR-808. Famed for its distinctive sound, the you can hear the TR-606 sound throughout original electro and hip-hop tracks. Just check out those tight and funky hi-hats, some of the best around! Nithonat expands on the fundamental 606 design with a wide range of controls. Tweak and shape each of its seven constituent instruments – Bass Drum, Snare Drum, Low and High Toms, Cymbal, and Open and Closed Hi-hats. Controls include Tune, Tone, Attack and Decay. Every instrument can be soloed and muted independently, too, and eight outputs let you route each one to its own channel in the host DAW’s mixer for processing and mixing if required. There’s also improvements to the internal step sequencer. Eight banks of up to twelve 16-step patterns, an accent lane, tap mode, shuffle control and a randomiser for instant inspiration. D16 include a bunch of factory kits and patterns to help when starting out. All in all, this is every bit a stone cold classic! Get the full version for free with Novation! Sound Collective is a community hub that significantly brings you, Novation and the most innovative software brands together. If you want to find great virtual instruments and effects, keeping up to date with the constant stream of new releases is essential. Sound Collective makes it easy, with regular free software downloads and generous discounts on high-end plug-ins. To join Sound Collective, simply register any Novation product, then look out for a new offer every couple of months.